This is the second release from the trio and was recorded, like their first album Interactions, at St. George's in Bristol. Blending melodic jazz with contemporary classical styles, Acoustic Triangle has carved a unique niche for itself. Malcolm Creese (bass) and Tim Garland (sax), are joined on piano by new member Gwilym Simcock. Featuring numbers from Simcock and Garland, the set also includes pieces from Kenny Wheeler, John Taylor, and Cole Porter. The opening number In A Wondrous Place provides a gentle introduction with Garland's fluid soprano sax lines underpinned by Simcock's delicate and responsive playing. Garland's Beyond The City The Stars is a darker-toned piece written in a rondo form - very much in the classical tradition. Creese has an opportunity to shine in this and delivers a fine solo. It quickly becomes apparent that this set is not only an outstanding example of virtuoso musicianship, but a well-judged collection offering overall unity yet allowing each track a distinctive atmosphere. Just take the achingly delicate soprano on Rosa Ballerina and set it against the jaunty, angular piano driving Coffee Time. My favourite, and perhaps the most distinctively classical influenced of the set, is Simcock's three part Sea Suite. This set is beautifully recorded, capturing the spacious acoustic of St. George's and the distinctive tones of each instrument. "Founder and leader Malcolm Creese neatly describes Acoustic Triangle's music as: 'melodic acoustic jazz with European classical influences'. Saxophonist Tim Garland combines playing and writing for this group with working with Chick Corea and his own Dean Street Underground Orchestra. The new member of the trio is the remarkable Gwilym Simcock. This 22-year-old pianist is exceptional, as both player and composer. His three-part Sea Suite is the high point of the programme. Together they make the most beautiful sound, so spacious and melting that you just let it float around you and feel better for the experience. But there is so much to listen to in the lyrical lines and subtle harmonies that it will inevitably draw you in." Malcolm Creese's commitment and progress as a leader is evidenced in this album. A virtuoso bassist and record producer of multitudinous talents, Creese is at his musical best here, as both an accompanist and distinctive soloist. Acoustic Triangle is an ever so appropriate name as the delicate and even balance of this triumvirate is in evidence throughout. Tim Garland, one of the premiere saxophonists in the UK today, is refreshing in his singular approach to the horn. He possesses a prodigious technique which he uses in an original and musical fashion. The sublime ferocity of his soprano and tenor are offset by his brooding, circular bass clarinet on his composition Beyond The City - The Stars. Pianist Gwilym Simcock's distinctive compositions feature widely, as does his interplay with Malcolm Creese - hearkening memories of the interplay between Bill Evans and Scott LaFaro. Songs by Kenny Wheeler and John Taylor fit in nicely with this collection, along with Porter's All Of You, which strangely doesn't seem to belong to this otherwise exemplary CD. It is a rare thing to find a group that has created its own harmonic language. Oregon is one such group; no matter what they play, no matter what the instrumentation, they are instantly recognizable due to the unique way they voice their harmonies, and to the way they place the instruments. 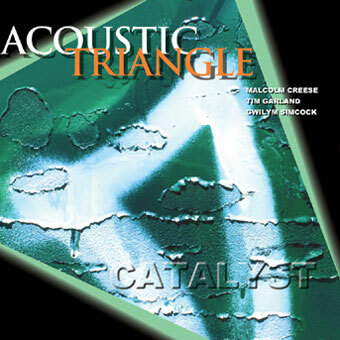 Acoustic Triangle, with their sophomore effort Catalyst, are clearly in the same category. They are creating a standard of language that differentiates them from other groups in the chamber jazz category, and is defining them as one of the best. Their first CD, the award-winning Interactions, was all about how the three musicians, bassist Malcolm Creese, reedman Tim Garland and pianist John Horler, interacted musically with the material. It is likely that the title of the new record, Catalyst, refers to the profound impact that Gwilym Simcock, who replaces Horler, has had on the overall group sound. As rich, warm and inviting as the first disk, but with a stronger tendency to the abstract, Simcock, in both his playing and his formidable writing, has pushed the group into forging a stronger identity. This is heady yet immensely engaging stuff, the perfect confluence of intellect and emotion, thoughtfulness and abandon. That Tim Garland's writing and playing continues to grow in leaps and bounds should be no surprise to anyone who has followed his somewhat meteoric rise in the British and international jazz scenes over the past few years. He continues to experiment with extended compositional forms; his nine-minute piece, "Beyond the City" is but one of the many highlights on this disk. This track covers a lot of territory: from quiet unison work; to individual solo excursions from each member of the trio; to segueing passages that blur the line between composition and improvisation. It is also a showpiece for Garland's stellar bass clarinet work, although he tends to favour the soprano saxophone for the majority of the album. Simcock contributes four pieces to the album, including another highlight, the three-movement "Sea Suite". Like Garland, he opts for extended form, eschewing the theme-solo-theme format so prevalent in much of today's jazz. Swaying between subtle introspection and extroverted bursts of rhythm, Simcock is the perfect foil for Garland's soaring soprano; deft and nimble, he is a young artist from whom more will most certainly be heard. Leader Creese tends to stay in the background for the most part, providing firm support throughout, although he is clearly capable of confident and lyrical soloing. Creese's tone is round and soft; his Arco work at the end of "Sea Suite" is nothing short of perfect. He is placed front and centre for the group's reading of Kenny Wheeler's "Heyoke". This track demonstrates the beautiful unpredictability of the trio; one never knows exactly where it will take a piece, in this case the serene introduction barely foreshadows the bright and outgoing climax it builds to, before settling back down for the final theme. Acoustic Triangle has a philosophy that dictates that there is no amplification of instruments in concert; they look, instead, for rooms with excellent acoustics and fine grand pianos. In recording they avoid use of outboard gear to process the sound; the room, then, becomes almost a fourth member of the group. Like Interactions, Catalyst was recorded at St. George's in Bristol, UK, and the rich sound of the room provides a natural reverb that no electronic gear can duplicate. Garland's saxophone, in particular, is enhanced by the sound of the hall. Like their first disk, Catalyst is also being released as a hybrid SACD disk, so that listeners can either hear an exceptional sounding CD stereo mix, or SACD stereo or 5.1 surround mixes if they have the appropriate equipment. The attention to every detail, from the depth of the compositions; to the placement of the instruments; to an instrumental virtuosity that never loses sight of the material; to the sound of the recording, make Catalyst an early frontrunner for one of the best CDs of 2004. ACOUSTIC TRIANGLE is the brainchild of bassist Malcolm Creese, formed in 2000 to play, unamplified, compositions that combine his two great passions: modern jazz and classical music. Catalyst (Audio-B, ABCD 5015) features Tim Garland (tenor and soprano saxophones, bass clarinet) and pianist Gwilym Simcock alongside Creese, and mixes their compositions with material by John Taylor and Kenny Wheeler as well as visiting 'All of You' by Cole Porter. The band's sound is assured and elegant, thoughtful yet surprisingly robust where necessary, and the balance between skilfully composed and imaginatively improvised elements is beautifully maintained throughout.